The typical day for a cowboy would involve a huge array of chores, depending on the season. But for some, it might start with packing his horse (and maybe a packhorse) with all of his worldly possessions. Then he’d start riding to the next ranch down the line looking for work. Most outfits, especially the smaller ones, kept a foreman and a few seasoned hands year round, and hired extra men as temporary labor when needed. If he already had a job, the day’s chores might begin by riding out in a group (sometimes called a ‘wagon’ because it was usually accompanied by a chuck wagon or a flatbed with fence-posts and other supplies for the day’s work). 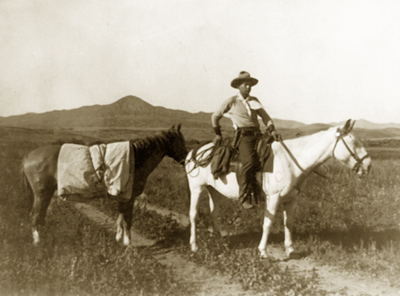 On big ranches, men would usually ride out in teams of two or three unless there was an event such as a roundup or branding at hand. 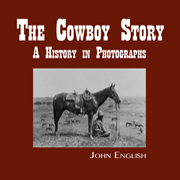 On what cowboys called a good day, they would spend most of their hours in the saddle. In slow times, they became farmhands, welders, drovers, fencers and a host of other trades. On a great day, the sun would shine and their job would be running down calves, or maybe even guiding a visiting friend of the boss on a hunting trip. A few days camping in the mountains meant that something other than beef was for dinner. Cows die. That’s just the way it is. Sometimes, they can be processed as vittles, but most of the time they just need to be buried or the coyotes get them. They supply us with milk, meat, gelatin, glue, glycerin and a host of other by-products. Even in death, this benevolent beast bestows gifts. Their hides are used for leather and rawhide, and even the hair has uses. Many cowboys are pretty good butchers, and always have been. They can cut up beef, mule deer, antelope, elk, pigs, sheep and even a bear every now and then. When cowboys have skinned enough animals, the hide man is called and he swings by the ranch in his pungent manner and hauls the hides away. Loading the hide man’s truck is not a job that cowboys fight among themselves to do. Hides are worth money, and even too many brands can ruin a good one. A muleskinner was a teamster who drove mules. He didn’t skin them. The term may derive from the fact that a good driver could outsmart these intelligent but obstinate animals. Another theory is that these men were so accurate with a whip they could touch the mule’s skin in spots that elicited an immediate and positive reaction. Above: A cowboy looking for work, c.1906 (photographer unknown). 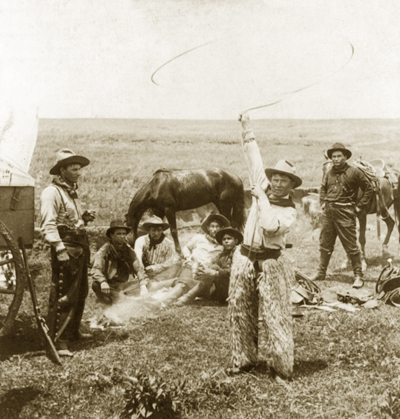 Left: An Oklahoma cowboy puts on a roping exhibition (Underwood & Underwood, 1905). When all of the cutting, carpentry, calving, hunting, hide work, hauling and myriad other chores were done for the day, cowboys were a pretty sociable lot. For many, their fellow bunkhouse tenants were the only family they had. That’s not surprising when one considers that they woke up with these men, worked all day beside them, ate three times a day together, and shared a roof at night. They believed in the same things, had the same values and shared a history and culture. Many of them came out West together as young men, and maintained lifelong friendships.